BitLocker Password by Thegrideon Software is advanced passwords recovery tool for encrypted BitLocker and BitLocker to Go volumes protected with User password. Highly optimized code (SSE2, AVX, AVX2) and GPU (AMD, NVIDIA, Intel) utilization. 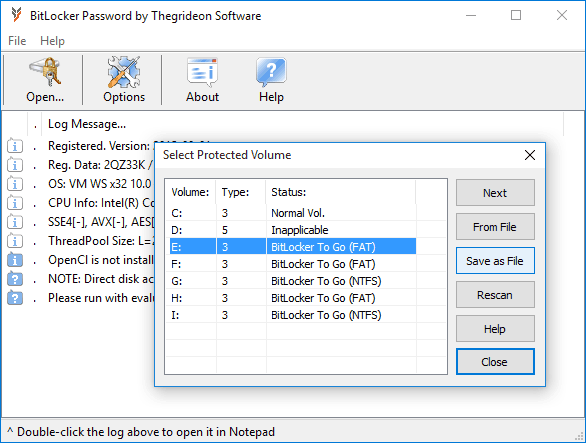 BitLocker Password by Thegrideon Software is advanced passwords recovery tool for encrypted BitLocker and BitLocker to Go volumes protected with User password. Several attacks can be queued: dictionary based, brute-force, mixed (combinations of independent dictionary, brute-force and fixed parts). Advanced keyboard layouts-aware recovery technique. Highly optimized code (SSE2, AVX, AVX2) and GPU (AMD, NVIDIA, Intel) utilization. QuickWiper is a disk and file wipe utility. With QuickWiper you can wipe free disk space and wipe sensitive files from you hard disk. QuickWiper provides quick and secure file wiping. You can use system cleaner to clear cache with one-click. Comfy Photo Recovery: a simple and easy photo recovery solution. With this powerful program, you can scan for images which have been deleted on a camera or hard drive. This program uses powerful tools to make sure your photos are recovered fully. It is often the unfortunate situation that files are lost from disks (eg flash cards, hard drives etc). It is therefore vital to possess a powerful tool that can recover as much missing data as possible.